Atomic Beam™ Headlight Is So Bright! It's useful for many situations and handy to have in case of emergencies. You can keep one in your car and one at home. Atomic Beam™ Headlight puts light exactly where you need it while on the move! Don't get stuck in the dark! Atomic Beam™ Headlight is the ultra-bright tactical headlight. READ FULL DESCRIPTION The military uses some of the most powerful lighting in the world, and now that technology is yours to use at home with Atomic Beam™ Headlight! 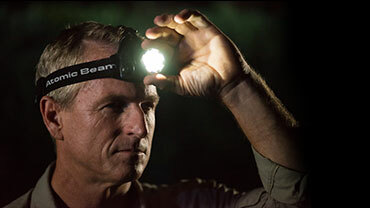 Atomic Beam™ Headlight is stronger and brighter than regular flashlights. With 5,000 LUX, it'll light up practically everything. Atomic Beam™ Headlight is also hands-free! It also has 3 settings: Low Beam, High Beam, and Strobe. Atomic Beam™ Headlight is perfect for whenever you want to see or be seen. You can also adjust the angle so you can aim the light exactly where you need it! You can get your Atomic Beam™ Headlight today for just $19.99 and pay NO SHIPPING & HANDLING! Your order will also come with a lifetime guarantee; if it breaks, you'll get your money back! Plus, when you order, you can get a 2nd Atomic Beam™ Headlight for just a separate fee of $9.99. Place your orders now! Adjust The Angle Of The Light So You Can Aim The Light Where You Need It! Atomic Beam™ Headlight Is Ultra Tough! Select Your Offer Above And See The Atomic Beam Headlight™ Difference!